OT, but wasn’t there a PTAB “precedential” opinion on a computing innovation following the new protocol that would have gone the other way following last year’s protocol recently? ** depending on the luck/unlucky if the draw of judges and their personal views…. Not for the first time, DC doesn’t tell his readers who the judges on the panel were. I’d look it up myself, but the link to the decision doesn’t work. Moore is kind of a respectable judge. She was definitely leaning towards anti-patent judicial activism when appointed and she wasn’t really qualified. She came from academia. She never had any real experience practicing –and definitely not 10 years–before being appointed. It shows that she was not qualified. She does have a science education. O’Malley is from a district court appointed by Obama. She is definitely not qualified, but was selected before Google started picking the judges. She is not qualified, but does not appear to be strongly anti-patent. But no science. No patent law. Chen had a little private practice experience. He was at the USPTO as solicitor and wanted to end all software patents while there. Strongly anti-patent and strongly judicial activism. He does have a science education. He was one of the Google selections that Obama appointed. I think he has been a disappointment for Google as he mellowed a bit, but still he is basically a disaster. He has helped with 101 a bit and hurt in other ways. Again, though, no private practice experience to speak of (1 or 2 years) and was appointed when he was talking about burning the whole system down. So you can see that what we really need to do is wipe the CAFC and get new judges. what we really need to do is wipe the CAFC and get new judges. Very serious and civil stuff from Bildo’s bff. Congrats, Dennis! How is that not serious MM? How is that not civil? The fact is that court stacking and remedies is a reasonable thing to discuss with the CAFC. There is plenty of evidence to start an investigation in how the judges on the CAFC were appointed. And there is plenty of evidence that they were appointed because they were anti-patent and judicial activists. The D’s are talking about adding justices to counter R’s not going through with Obama’s last appointment before Trump. You are taking to the guy with more posts expunged for being inappropriate than anyone else. Anyone else? Heck, Malcolm has had more posts expunged than everyone else combined. He’s just whining mindlessly again. Plus, the proper way to frame the CAFC judges is that they were selected by money from SV to burn the patent system down. Few people would say that this argument does not have substantial evidence to support it. I am all for overturning Citizens United and complete reform of the campaign finance laws and ethical laws of people leaving government. I’m getting that strange feeling again Ordinary Squirrel that you suffer from mental illness. So saying vaguely conspiratorial things is a sign of mental illness? Well, Moore is from Alpha-Centauri and Alpha-Centaurians are known for their dislike of patents law. One way to understand the legal issue here is to appreciate that once an article or composition becomes obvious and falls into the public domain it can’t later be deemed non-obvious because someone discovered a new property or benefit of the article or composition. For instance, a candy bar with cashew nuts and dried pineapple pieces is obvious because … sweet and nutty yum yum. It doesn’t become non-obvious because I “discover” that eating it reduces the risk of tongue cancer in certain Eskimos. It’s still predictably sweet and nutty, and therefore obvious. You are confusing anticipation (and inherency) with obviousness — most definitely not the way to understand the legal issue here. No, I’m talking about obviousness. You are the one who is confused. Stop tr olling, Bildo. Further, your discovery may well be able to be patented as a method (see 35 USC 100(b)). Right. I’m talking about the obviousness of claims to compositions and articles, not claims to non-obvious methods of using those compositions. Your talking out your @$$. One item won’t present a case of obviousness, as obviousness is a matter of combinations. What you are suggesting with a one item (being in the public domain), is instead anticipation. Your own words regarding some “newly discovered” property of the one thing makes clear that you are not presenting the proper legal issue. The proper response, Bildo, is that you need to G F Y.
Aw, poor whiddle Malcolm is going apoplectic, noting of course that you don’t touch the substance of my comment (which is absolutely correct). Oh, I touched the “substance” all right. Not the legal issue substance. And certainly not in any cognitive manner after you were corrected. Dennis lives you, Bildo. You’re a very serious person. MaxDrei appears to double down with at least one aspect common to his posts at 4 and 5: a decidedly odd (and very much antiquated “Jepson” style of application. Someone tell that fossil that such was long ago made very non-desirable due to the patent profanity created by the courts — and ANY such “requirement” is made into a virtual NON-requirement by the caveat of “where applicable, and as given the patent profanity, it is excessively rare that such “applicability” reaches enough merit to actually be engaged. the device lacks a folding seam between the tabs and the deflector. Key word: lacks. In other words, an “n-1” claim. Everything is included, except the “1” which the prior art has disclosed. Such claims are notoriously obvious. As to combining Conrad ‘009 and Raviendran, and the reason to combine served up by the PTO,why should anybody want to make the Conrad thing physically stronger? Was it not strong enough to be fit for its deflecting task? If it was strong enough already to be fit for purpose, out of the window goes any “motivation” to render it (pointlessly bulkily and expensively) physically yet stronger. Having looked at the patent application and the two pieces of prior art, I regret even more the court’s flight of fancy about making the connection between the deflector and its tabs stronger. They were quite strong enough already. No need at all to make them any stronger. Conrad ‘009, the inventor’s “Mk1” product, is a 2-D sheet which, in a first step, is folded along a crevice in the sheet into an L-shape and then, in a second step, curved to conform to the outline of the target hinged seat. Raviendram is 3-D, L-shaped and has a fixed curve. Conrad’s Mk 2 product retains the variable curve of Mk 1 but reverts from the seam to the old L-shape. So, his claim is to something that is easily bendable about a vertical axis but resists bending about a horizontal axis, which is a nice new combination of physical attributes, one not shared by either prior art product. And elimination of the crevice eliminates the site of odour. That’s nice too. But this “unknown problem” story is a bit rich though, isn’t it. Nobody knew that Mk 1 had a crevice? Is that it? Nobody knew that Mk1 suffered from a lingering odor problem? Really? Nobody knew that it was the crevice that was the site of retained odor? Come on! Nobody knew that getting rid of the crevice would eliminate the lingering odor? Nobody had a clue how to eliminate the crevice? Is the PHOSITA completely devoid of any sense at all? In terms of EPO problem and solution approach, what we have here is a claim that solves two problems, namely 1) how to fit a range of differently curved seats and 2) how to render the device cleanable. For each of these two problems, the solution is obvious. The tabs of Mk 1 solve the “fit” problem. The elimination of its crevices will solve the whiff problem. I just have a lingering feeling, that had the claim majored on the unique anisotropy of bendability in the plastic moulding, and the local variation of bending capability over the moulding, the claim might have fared better and even made it to issue. Raviendram also includes an embodiment integral to the seat that provides an even better “axis-bending” as well as seam eliminating feature. Prompted by your comment, I had another look at Raviendram, and found his disclosure of using heat from a hairdryer to soften and bend to the desired arc radius a linear L-shaped plastic extruded section. But axis bending with a shield unitary with a toilet seat I did not find. Sadly, I found in Raviendram not one word about how an absence of urine-harbouring crevices is advantageous for hygiene. Seems like the point did not occur to Raviendram’s drafter either. Strength in the axis bending AND seamlessness are both inherent properties in the embodiment in which the seat and the shield are provided in a single integrated item. Don’t understand. When the shield and the seat is provided as a single unitary plastic molding, there is no requirement to bend the shield to fit the curve of the seat. You are taking about a process step for the end item whereas the end item already has the bending strength. He wanted to bend in both directions of curving to match any particular bowl/seat curvature, as well as bend for the tabs without scoring (having a seam) for the tabs. There was no sense of unique anisotropy, and certainly no “local variation” was there? Still not following you. Conrad Mk. 1 was a sheet of material ie flat. The bits destined to be tabs you bend 90° away from the plane of the sheet. 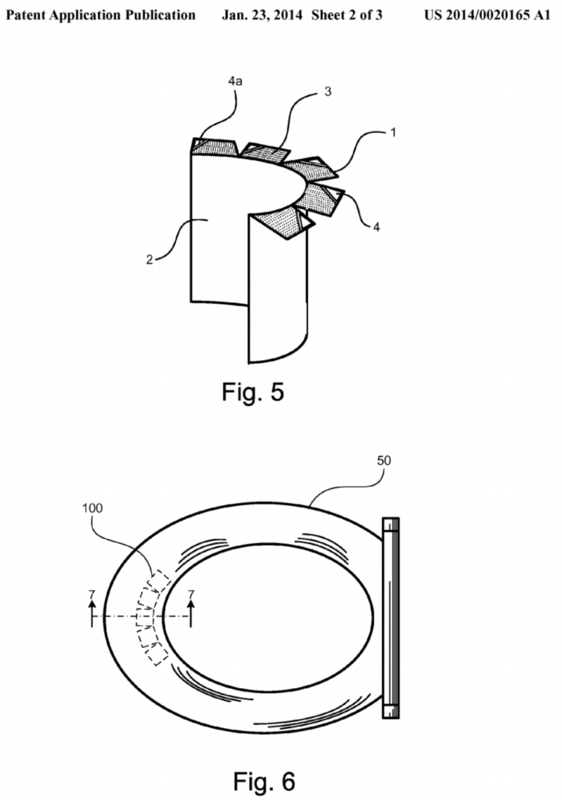 Then you bend the sheet into an arc that tracks the curve around the circumference of the toilet seat at the front. The claim to Conrad Mk. 2 specifies tabs set “permanently” at 90° to the deflector. Conrad Mk. 2 is therefore very much not a sheet product. But, like Conrad 1, it must bend to track the curve of the seat. Conversely, its tab-deflector line of junction is forbidden to bend (the opposite of the crevice junction of Conrad 1). The bend axis for tracking the seat is orthogonal to the bend axis of the tab-deflector junction line. Ergo, anisotropic bend capability. The application is entirely silent on the aspect that you want to see there. There simply is no indication that the material is special in one direction from another. Then the alternative, and perhaps better non-obviousness argument applies: There was a long felt need without solution. Therefore, the solution must not have been obvious. Les, one has to be circumspect with the hoary old “long felt need” argument. Even if there was “long” there is often no “felt need” during that long time. What if Conrad Mk 1 was the only prior art shield which exhibits a urine-retaining crevice, so only users of Conrad 1 have any such “need”? What if they were all fastidious about hygiene, to the extent that urine in the crevice got cleaned away frequently enough to extinguish any whiff before it ever became a problem? No “need” then”. No “felt” either. And as to “long”, it wasn’t long, was it, before Conrad came up with the Mk. 2 improvement to his Mk. 1 product. The more likely explanation is that Conrad himself fingered the crevice as a negative feature, eliminated it, and then called upon his patent attorney to obtain an improvement patent on the crevice-free Conrad Mk. 2 product. That attorney exercised his (or her) creative faculty, and came up with the “problem invention” line. Well, having to clean urine out of a crevice seems like the other side of the same problem to me. Just because people shrug and say “that’s the way it is, what can be done” and put up with the situation doesn’t mean the need isn’t felt. If you want to run the “long felt need” line of argument, you carry the burden of proving that, for all of a long time, real people were aware of a real problem and never came to the idea of solving it with the claimed combination of technical features. I’m saying that there is no evidence that, for a long time before Conrad 2 was drafted, there was an ongoing recognised “problem” perceived by users of Conrad 1. I’m suggesting that persuasive evidence of any such “long felt need” just wasn’t there. What Les is trying to tell you MaxDrei is that you cannot have it both ways (he is not trying to carry a legal burden or persuasion as you are indicating here). Perhaps it is too nuanced for Les to understand that not everything that IS legally obvious is also captured in a real product. He too appears to want “obviousness” boiled down to an actual case of anticipation. I doubt that you do, but am curious how you will respond. Les is not likely to answer either you or I at this point. But I am curious as to why you doubt my supposition. Do you have more than merely a feeling? Anything to support that doubt? An alternative view of Les’s position that runs counter to my supposition? Max – The poster above is half right. In this conversation, I don’t have to prove long felt need. You stipulated to it with your the rhetorical sarcastic questions. I believe my first post to you in this tread was even presented in IF … THEN form. Your unwillingness to refer to me directly says far more about you than you might think Les. Now about this “half right,” thing, how is it that you think that I am not completely right? Are you not depending on the ‘ol “if it was obvious, then why did no one do it” line of thought? I may pick on you quite a bit (and rightly so), but you do bring up a salient point here that is often put forth incorrectly by examiners (and held feverishly, regardless of the actual and full requirements. “Motivation to combineis just that: to combine. One can tell that one has a lazy Examiner when a purported motivation is provided and is a direct quote from the secondary reference — for the value of the secondary reference alone, along with a glib “well, anything is made better with this secondary reference, so combining is de facto motivated, regardless of what is going on in the primary reference. That being the case, if all that is left is arguing against “motivation,” the client may well want to consider other amendments if possible. What am I to say in reply, but that the CAFC endorsed the Examiner’s reasoning. If as you say, the Examiner here was “lazy”, it was with the approval of the Court of Appeal. Hence, Night Writer speaks out. (Also note that the better argument was not made below, and thus, was lost before the CAFC). Question: can anybody please confirm that this patentability case was to be decided on pre-AIA, first to invent law? “…need or problem known in the field of endeavor at the time of invention”. Under First to Invent law, the date of invention is perhaps of some significance when thinking how to adjudicate obviousness. Under First to File law, however, the “time of invention” plays no part in the thinking whatsoever. The writing of the specification, when one contrasts the invention with the disclosure content of a prior art universe already searched with knowledge of the invention, is something that happens AFTER the “date of invention” but BEFORE the date of filing. So, in a FtF jurisdiction, one expects and requires the filer to present the invention in the context of the closest prior art. I continue to await with interest a dawn of realisation of the consequences of all this, amongst commentators in the USA. But apart from all that, if the claimed subject matter was anyway obvious at the priority filing date, its solving of the odor problem is, under the established case law of the EPO, not a reason to recognise patentability but rather a mere “bonus effect”. You need to prove when you invented to the court. That is the deciding factor. reduction to practice, that is way more important to the case than stealing it and claiming the thief came up with the ides. Max – I haven’t had a chance to check. But the January 2014 publication date implies a priority date in 2012, which would make the case pre-AIA. I just gotta say that I’m amazed — flabbergasted, in fact — that Dennis was somehow able to resist trickling a couple a p.e.e. related puns into his write-up. Maybe they are hiding in there and I missed them? It’s entirely possible given the famous, um … dryness … of D’s wit. It is the epitome of lack of objectivity to be subjective as to whether or not the problem has a relation to obviousness. It’s important to note that the Federal Circuit never ruled on the separate motivation issue. The argument was waived below, so appellants couldn’t challenge it on appeal. Query how Eibel Process evidence plays into the analysis if one could argue that the separate motivation is very weak.